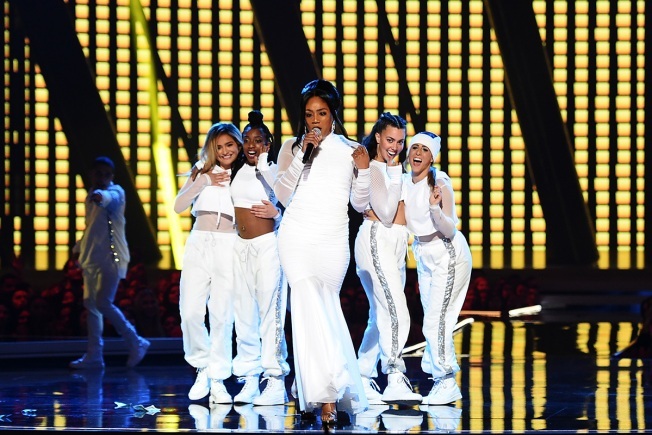 Host Tiffany Haddish, center, recreates Cardi B's "Saturday Night Live" performance at the 2018 MTV Movie & TV Awards at Barker Hangar on June 16, 2018, in Santa Monica, Calif.
Tiffany Haddish is making money moves at the 2018 MTV Movie & TV Awards. During the comedienne's hilarious opening monologue, Haddish rocked her best Cardi B impression with a new rendition of the rapper's smash hit, "Bodak Yellow." The evening's emcee joked that Cardi lent her the same white gown she wore to debut her baby bump during "Saturday Night Live" earlier this year. Haddish also took a moment to give props to actor Michael B. Jordan, joking that he's able to impregnate women with just one look. Jordan's bedroom eyes apparently worked wonders: As soon as Haddish turned to the side, her stomach began to inflate! Cardi B reveals why she chose to confirm pregnancy rumors during her "Saturday Night Live" performance, reaffirms her Twitter love for Chrissy Teigen and teaches everyone how to use her popular catchphrases correctly. Before Haddish took the stage inside the Barker Hangar in Santa Monica, California, she was joined by Queen Latifah, Jada Pinkett Smith and the stars of "Black Panther" for a comedic sketch based on the blockbuster action flick. As for the rest of the opening monologue, the "Girls' Trip" star poked fun at everyone, from the Kardashians to Zendaya to the cast of "Stranger Things." "I'm always excited to see the Kardashians. That family is basically the 'Star Wars' franchise, OK? They make a ton of money, a new one is always popping up and they're ruled by a bossy overlord who sleeps in a mask and she love black men, so yes!" Haddish teased. Kim Kardashian and mother Kris Jenner, both in attendance, were doubled over in stitches.